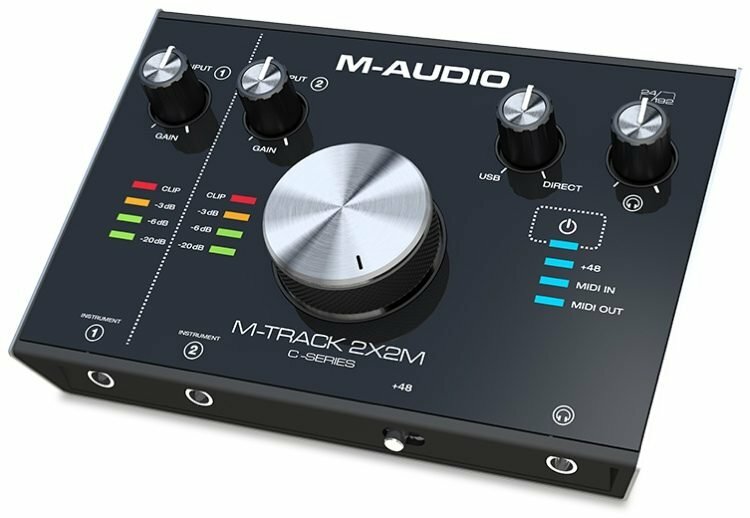 With the M-Track 2x2M, you can create 24-bit/192kHz studio-quality recordings with an intuitive and easy-to-use audio interface. Boasting an elegant pro-grade metal chassis with a large central volume knob, the M-Track 2x2M features transparent low-noise pre-amps and pristine A/D converters that deliver the highest audio performance in its class. 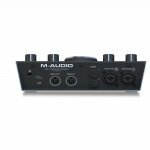 The M-Track 2x2M enables you to record up to 2 channels at once with its dedicated XLR/TRS balanced combo input, and an all-new 1/4” instrument input that has a specially designed gain and impedance stage to provide the most accurate representation of a guitar or bass plugged directly into the interface. 5-pin MIDI In and Out connections are included for connecting synths, sequencers and other external MIDI gear. The M-Track 2x2M connects to your Mac or PC via a standard USB or USB-C port using one of the two included cables. This premium Hi-Speed USB connection enables you to have zero-latency monitoring of your inputs, making the recording process easier than ever. The overall combination of professional audio performance, easy-to-use features, and the included software bundle that provides everything you need to start recording now makes the M-Track 2x2M an amazingly versatile, high-performance audio interface that sets the new standard for its class. Comes with Pro Tools First.